Matrix Laboratory also known as MATLAB is a high-level programming language. It provides an interactive environment to perform computations in various fields such as mathematics, sciences and engineering streams. The results can be visualized and generated as reports for further analysis. Matlab is the pioneer in combining these things. A team of professionals develop the toolboxes and release only after rigorous testing. Prior knowledge in Java, C, C++, or Fortran languages is helpful before using Matlab. Various math functions and Built-in library commands are used to analyze data, generate plots and perform complex Integrations and Differentiations. 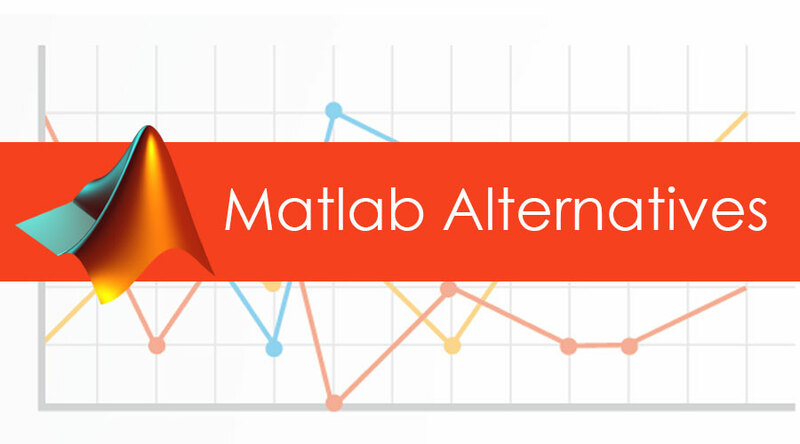 Here we discuss the list of Matlab Alternatives. Without access to the source code of Matlab, one cannot understand the full functionality and the use cases of the various built-in functions or modify them. A single license file can cost hundreds of dollars. It is probably on the higher side for people who are outside any organization. Fortunately, there are several Matlab alternatives that provide free access. Based on the objective of the User one can aptly find something similar to Matlab. If you are looking for anything closer to Matlab in terms of compatibility and computational ability, then Octave is the best Matlab alternative. Most of the projects developed for Matlab run on Octave too. It runs on any Operating system without any modifications. Can handle powerful mathematical syntax and is equipped with plotting and visualizing tools. Compatible with Matlab scripts and other modules written in Java, C++ or Fortran. Scilab is an open source similar to the implementation of Matlab. The approximation techniques known as Scientific Computing is used to solve numerical problems. To achieve this, the team of Scilab developers made use of Solvers and algorithms to build the algebraic libraries. Scilab is one of the major alternatives to Matlab along with GNU Octave. Another alternative of Matlab is Maxima which was inspired by the legendary Algebra system Macsyma. It is a system used for manipulating numerical expressions such as Taylor series, Laplace transformations, Vectors, Tensors, and Matrices. Very accurate results are provided by using exact floating numbers, fractional values, and integers. The Source Forge file manager consists of all the pre-compiled binaries. The source code can be compiled on Windows, Mac OS, etc. The data and functions can be plotted in two and three Dimensions. It is available publicly with active usage. Maxima undergo frequent updating to remove bugs and improve the coding. New suggestions are provided by the active community members. Sage Math is another software system that provides an alternative to MatLab. It is Used to analyze large data sets and help in scientific researches. Built on top of Python-based scientific library. Python is clear and easily readable. It is syntactically similar to Matlab. It provides a command line interface and embedded tools to carry out mathematical functions. The installation of Sage is free of cost and can be customized. We can add modules at any stage. Matlab may process the large data sets faster due to its Fortran compiled library files. But Sage being cost-efficient the minor lags in time frames are ignored. AnyLogic is the best Matlab alternative which is an open-source simulation software to deal with any Business challenges. It is a virtually pleasant drag-and-drop environment. It includes a graphical modeling language written with Java and can be customized. AnyLogic provides a platform to solve Dynamic business challenges by simulation of the needs. There are various tools to resolve complex business modules and provide elegant reports and workflow models. Thousands of Commercial organizations, Academic institutions make use of AnyLogic. Increased efficiency and better risk analysis to tackle complex business challenges, is a significant feature of AnyLogic. Matlab cannot match the flexibility to capture the complexity and provide such higher insights. A dynamic programming language used to perform analytics on numeric and computational sciences. The simple syntax makes it comfortable for data analysis. It is capable of using multiple C and Fortran library codes. It allows for computing data parallelly or sequentially on distributed clusters. Multiple dispatches are a feature of Julia which combines functional behaviors from different argument types. Automatic and more specialized codes are generated by calling Pyfunctions and C functions. Julia makes use of a built-in package manager. The test code can be experiment quickly through REPL (Read-Eval-Print-Loop) through an interactive shell session. Multi-dimensional data can be loaded quickly and functions such as aggregations, joins can be performed. It is compatible with other interfaces such as Java, R, etc. Julia can be downloaded and run by anyone, and the installation is pretty straightforward.